Victor or pride of Devon are other names for this classic. 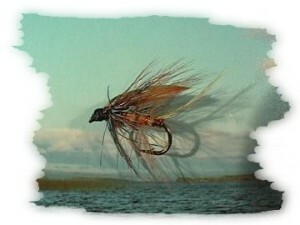 A very reliable fly for bigger lakes, imitating sedges and sedge pupa. When these flies scoot along the surface, it very often pays to put the Invicta on; best position is top dropper. The Invicta can be fished as a mayfly pattern; particularly on Loughs Erne, Arrow, Melvin and the Assaroe reservoir, or any other of the great Irish Mayfly waters, as a matter of fact. It should not be overdressed, materials kept to a minimum; hook sizes 8 to 12 are most appropriate. But even a size 6 can sometimes be of good use in big waves. 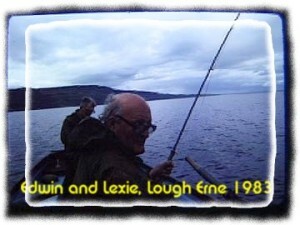 Best fishing in the world, Edwin laughed, sitting in the stern of his boat, casting the flies after a rising trout. Mayfly-time at Lower Lough Erne; this mighty expanse of water with countless islands and shallows; zzapp, there was the take; didn't I tell you? Invicta his faith in this pattern as a mayfly imitation was unshakeable. A hatch was on. Everywhere around us they came up, the boat allowed us to be very close to these flies; it was clearly visible how they surfaced, developed in just a few seconds from a nymph into a Dun or Subimago; erected their wings to get them dried by the wind and then tried to flutter off. In this stage they are easy prey, for fish and for birds, which manage to pick a mayfly off the surface after a dive of six or seven meters, without causing the slightest splash; or they get them in mid air, glonk is all you hear. Surrounded by a uniform carpet of shucks, interrupted by rings of rising trout you drop your artificials in the water. Towards evening Edwin looked on the lee-sides of the bigger islands for mating mayflies and a Spinnerfall. The males dance with rapid wing movements a couple of meters above the bushes and glide down again, repeat it until the females, ready for the wedding celebration, leave the bushes. That Spinnerfall Edwin was waiting for developed into a real nature drama, thousands of mayfly females came down to the water and laid their eggs, best fishing in the world and the trout feed like mad because an egg-laying spinner is the greatest delicacy to them. The wind eases, the water smoothes itself out. Murmur and gentle roar around, all other noises decline during sunset. When darkness breaks in they go back to the water, lay their eggs and die, drift spent, wings spread on the smooth surface. Trout feast. The more fish rise, the more feverish becomes the casting, where to doesn't matter, the boat is right in the middle of it; that is the whole problem: there are too many real flies floating around, the chance that your imitation is picked out of thousands of the real things is remote. That doesn't matter, a brace of good trout is caught earlier on already, what is happening here is simply an unforgettable spectacle, an ecstasy for mayfly, trout and angler. All of a sudden it is pitch dark and we are still somewhere in the middle of the lake, 26 km long and 8 wide, sitting in a boat behind some island listening to fly-sipping trout and our casting, gee Edwin, how do we find our way home now? No problem, said Mr. Dixon relaxed, my car has lights.